Contact us for a free on site security evaluation of your business or residence. Q Security Solutions’ commercial security systems can significantly reduce the threat of intrusion, enhance operational efficiency, and protect your employees, assets and customers 24/7. Our trained experts will access your unique commercial environment, recommend a solution that is right for you and set up professional installation by one of our certified technicians. If you have questions about getting started with a commercial security system, or are a client who needs assistance, please call us toll free: (888) 581-2367 or click here to contact us now. Q Security Solutions can evaluate and recommend security solutions for your company’s unique needs. You may consider Opening and Closing reports as a way for you to keep track of events occurring at your business. Opening and Closing reporting is a tracking system that gives business owners and managers critical information that assists in watching day to day operations. Depending on the option you select, opening/closing reports can be supplied to you monthly or weekly. Contact us today for a free consultation or call us toll free at (888) 581-2367 for immediate assistance. Q Security Solutions is your dedicated partner in providing today’s finest business security alarm systems to fit your needs and budget. Our security products and services are only available to you by our First Alert Professional Authorized Dealer Network, who value and care about your safety as much as you do. 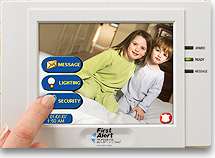 First Alert Professional dealers help build safer communities by supporting our Life Safety program as well as protecting millions of businesses around the globe using our professional security products. Call (888) 581-2367 today for a free security evaluation.